Tomato Quiche! A light lunch Per portion: only 211 calories! Cut the top off the tomatoes and remove the flesh inside. In a bowl, mix the eggs, low fat cream, chopped basil, salt and pepper with a whisk. 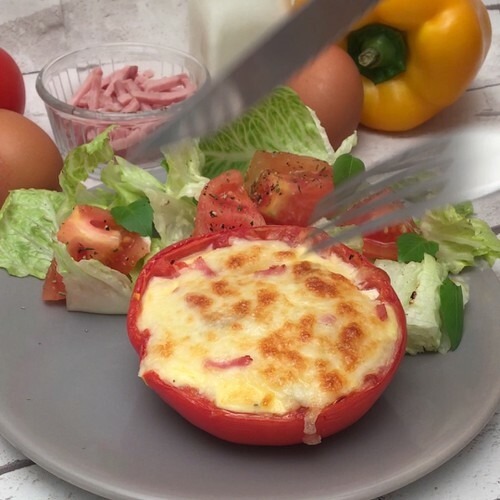 Divide the ham and egg mixture between the tomatoes, then place them on a baking tray and sprinkle with the low fat grated emmental. Bake for 30 minutes at 160 °C. Add to the leftover chopped tomato flesh the lettuce, and season with mixed herbs and low fat salad dressing. Enjoy the stuffed tomatoes with the salad.